~Who is in the lead? A lack of respect (for your authority) often shows up when the Weimar is walking on the lead (or leash). Go anywhere there are dogs, and you will see dogs lunging and yanking on the leash. You see dog owners pulled down the street. This scenario is scary stuff for a public venue. Some owners gain compliance early in their morning walk only to find when they turn for home it is almost impossible to prevent the pulling. It is as if to say, “I know where we are going, and I can get us there.” It’s true. Maybe this is a horse-thing–heading for the barn syndrome. Nonetheless, it is smart for you to be in control and for them to defer to your pace. I understand how much fun it is to have the off-leash freedom. I say go for it when it is appropriate and once you have this skill mastered. There are places where being off-leash is safe. Otherwise, you need to reel them in, and to get them to comply by walking on a loose lead at your side. Pulling, lunging, and dragging you where they want you to go is not Okay. 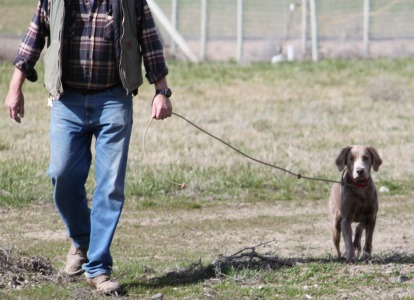 When faced with this scenario, many people turn to a front-clip harness or a head-halter like a Gentle Leader. Yes, these get you away from the behavior, but they don’t change the underlying cause of the problem. I urge you to master the loose-lead walk. I see it as a necessary skill and a sign of respect for your leadership. Posted on April 3, 2018, in Behavior & Training, Information and Education, Training and tagged Earning your Weim's respect and compliance, Gaining Respect, Importance of Compliance on Leash, leash training, Loose leash, Loose leash compliance, obedience training, Respect. Bookmark the permalink. Leave a comment.